It's true. We are Minion mad in this household. Those adorable yellow fellows from Despicable Me, who now have their own movie. So when we were invited to BT Tower to meet the Minions and watch their movie (surprisingly, called Minions) we jumped at the chance! Once through security - you can never be too careful which villains could be about near the Minions - we were warmly welcomed to BT Tower by the stars of the show themselves. Bob, Stuart and Kevin posed for their photos and our boys were delighted to meet them. Now, it's no secret to our family, friends and work colleagues (yes, Daddy's office is full of minions) how much we love Kevin and his friends. And we were not disappointed. I won't give anything away, but for those in the know let's just say King Bob, snowglobe and the super ukulele were just excellent. Laughs and fun throughout, this is a movie not to be missed. And Minions is available on BT Store from Monday 2nd November so there's no excuse to miss it! After the screening we were zoomed quite literally to the slowly rotating 34th floor, with its amazing views over London. And there we were met again by Bob, Kevin and Stuart for another photo opportunity. We've been lucky enough to see some of David Croft's balloon models before, and were really pleased to see him again, making balloon Minions for everyone to take away. And right there watching over us were the three huge balloon models he made for the event. D loves balloon modelling, having been on a short course himself, so he loved watching David and having a go himself. J and D enjoyed colouring in Minions over lunch, but decided that wandering around London with facepaint or painted nails was not for them this time - but there were Minions everywhere we looked. Steph's daughter from Steph's Two girls kindly posed for a nail photo! As we left we were kindly given some fantastic Minion goodies - from the cuddly Kevin, to Minion umbrellas and cookies. Sadly Miss T was not able to join us for the day, having been taken ill at the last minute. But those loveable Minions made sure she didn't miss out and sent her very own goody bag so she could enjoy it, too. 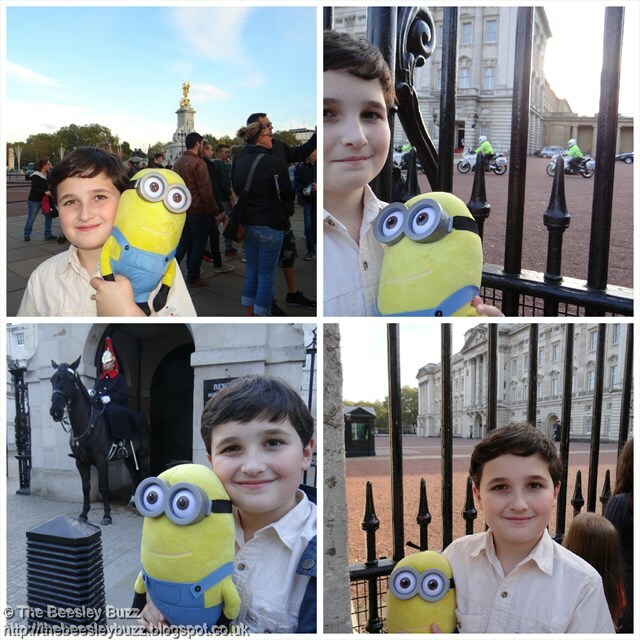 Following in the footsteps of Bob, Kevin and Stuart in the movie, our own Minions hit the streets of London too. When Joyce Mildmay's husband is killed in a tragic boating accident, her world is torn apart. With their three children desperately missing their father and she missing her soul mate, she tries to bring some sense of normality to all their lives. Living as they do in a secure gated community just outside Bristol, with her family in similarly luxurious houses on the same development, Joyce is surrounded by those she loves. But when a letter arrives from her husband six months later, delivered belatedly in the event of his death, her life is shattered. The letter contains a frightening warning, that all is not as it seems. That her father, Henry Tanner, and his business has secrets that present a danger to her and her children. Her family has always been shrouded in secrecy, and she knows little of the truth behind the letter. Yet she knows she cannot confront her father, that her mother is unlikely to support her against him, and there is no one else to turn to. This is a truly exciting adventure. Part way through I felt the 'big reveal' was too soon and that some of the mystery was lost - but I was happy to be proved wrong. The twists and turns kept coming right to the last page, and as the plot emerged I had no idea which way it was going to go. I loved this book. Really well written, and plenty of suspense. It's impossible to tell who is being honest, and what is really going on until the end in this tense novel. 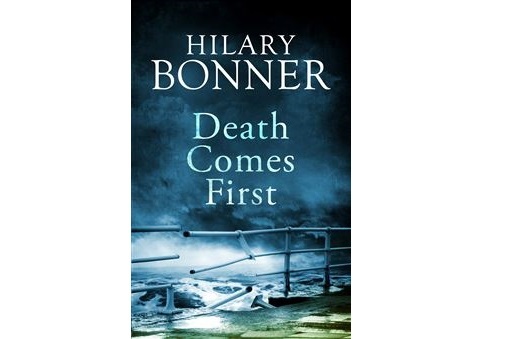 Death Comes First, by Hilary Bonner, is published by PanMacmillan and is available from their website. Here's my Vlog making Chocolate and Coconut Pie from John Torode's new cookery book, My Kind of Food. Despite having guests round last night, I didn't risk making this as I had never made Italian meringue before and didn't want it to go wrong. So the guests got shop bought dessert and we got to eat this ourselves the next day. But now I have made it, I'd definitely make it again for guests. I love that it has a slightly 'rustic' look to it - You don't need to pipe the meringue - just spoon it on and it still looks good. Even Miss T could help with that part! Next time I would keep the chocolate filling on the hob for longer to thicken up a bit more. It did set ok once in the fridge but I think it should be a little firmer. I love that it has a biscuit base - easier than making pastry and also tasted better in the pie especially with the dessicated coconut incorporated into the base too. Although I switched the coconut liqueur for a couple of tablespoons of raspberry liqueur - it seemed to work fine. You could still taste the coconut flavour from the dessicated coconut and the raspberry liqueur just gave it a little twist. Next time I will make sure I buy some coconut liqueur in advance, though, so I can try the recipe in it's exact form too. Overall, a great dessert that I'll be making again and again. 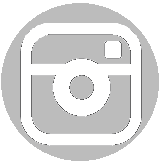 You can find out more about John Torode's #MyKindOfFood here. You can also download the recipe for this Chocolate and Coconut pie and a few of the other fab recipes from My Kind of Food here. A long overdue link up with #smallstepsamazingachievements. All 3 of my children have made me incredibly proud recently. Let's start with the eldest. J aged 11. A few years ago no-one could have predicted what the future would hold for him. Educationally things were looking bleak after two unsuccessful attempts at two different schools. In all fairness to J those schools turned out to be clueless when it came to ASD so it wasn't his fault that things turned out the way they did but it battered his self-esteem and confidence. Whilst home-schooling, I daily questioned myself about whether we were doing the right thing (we were). We knew J was bright and we wanted to enable him to fulfil his potential - something that both his previous schools had failed to do. After 3 years at home, he returned to school. This time equipped with a SEN statement and a school that really knew what they were doing. He just thrived. You can read my poem about his rather different journey through primary school here. Then it was time for secondary school which he started in September. A notorious time for ASD kids to struggle - such a big change to routines and the familiarity they were used to. Although he missed his old school a lot, J loves his new school. We had warned him that he may well have been one of the brightest kids academically at his old school but here all the children have had to get the top grades in their 11plus exams to be here so he wouldn't be such a high flyer here. Well we have had to eat our words. He has been getting top marks in tricky subjects like mandarin and maths and comments in his contact book about how the other kids are struggling with some of the homework but J had no problem at all. When his CATs test results came home we cried. We were just blown away. He's in the top few percent in the entire country!!! (Top 1% for verbal reasoning, top 3% for quantitative and top 4% for non-verbal reasoning test). Then we got an email to say J is one of the top 14 who have been chosen to take part in a science day doing GSCE level experiments! Wow! The really incredible thing is not necessarily these results. Yes they are amazing. But more amazing is the fact that J is at a school, happy, comfortable, supported, encouraged and doing well. All of these things are enabling him to fulfil his potential. For someone with his academic ability it seems the work is straightforward but the ability to attend school and be in the right frame of mind for school work was the challenge for him in his early school years. So we recognise just how much he has had to overcome to get to where he is now and that makes us even more proud of him than the test results themselves. Now onto Mr Middle - 9 year old D. Sometimes we joke about poor D having 'middle child syndrome' - exacerbated by being sandwiched between J with all his demands with his aspergers (he may be thriving at school but things are far from perfect at home at times), and little Miss T with her medical condition of JIA and all the appointments, injections and worry that goes along with that. D is just expected to get on with things, which by and large he does. We have noticed traits that he has like difficulty with change, sensitivity to clothes and so the new academic year for him has been a struggle. Unlike his big bro, the academic side of things doesn't come so easily to him and yet when he works hard, he does get there in the end. D thing is more about hands on practical stuff. 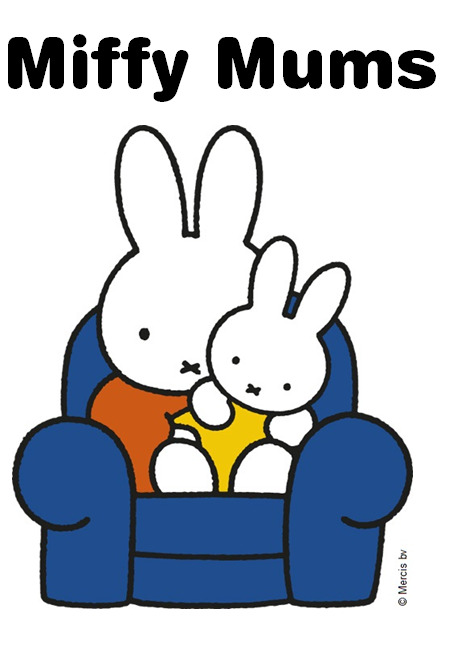 He's brilliant with his art and comic drawings and of course his cooking and baking. After this happened last year, and then this, we honestly didn't think anything would top that (I mean what could be more incredible than getting to have afternoon tea with Mary Berry - I still think it was just a dream). But he has gone onto having a couple more amazing baking successes this year. I will say no more at this stage as I'm hoping he will want to blog about them himself when he finds the time. But one of the things I am most proud of is that he volunteered (or perhaps was volunteered for it) to run in an inter-schools cross-country. Now he has never shown an interest in running, nor does it come easily to him so he was really out of his comfort zone. But he ran. The fact he did something so out of his comfort zone and was the only one from his year group representing his school makes us incredibly proud. And last but certainly not least is little Miss T who has astounded us with her bravery again and again. I'd be pretty fed up by now with weekly injections that are likely to continue for a further two years at least, along with the many blood tests and x-rays and eye-checks she has to have (she had uveitis earlier in the year which can be common amongst children with JIA). But she continues to take it all in her stride. She's adjusted to using a wheelchair at times and is learning to recognise when she does and doesn't need the wheelchair depending on pain levels and how much inflammation she has. She started a little drama class recently and has taken to it like a duck to water. She's just an amazing kid and smiles through it all! Morning, noon and night, will my milk drinkers get it right? The Cravendale Taste Test! Cravendale is known as the milk drinkers milk and who better than my three milk drinkers to put it to the test! Their daily routine usually includes a glass of milk with their breakfast and a glass of milk before bedtime. During the day they can choose to drink either milk or water as they are the healthiest choice (squash or juice are only permitted on special occasions) so they will often choose milk. Cravendale is pasteurised AND finely filtered and that removes more of the bacteria that turns milk sour so Cravendale stays fresh for longer. It is also supposed to taste better too so that's where my little milk drinkers stepped in to do a genuine taste test of Cravendale versus regular milk. There are plenty of products that claim to taste better than others with marketing messages and packaging blurb so how could we be sure? That is why we did a genuine taste test where none of the children knew which was the Cravedale and which was the regular milk. I was amazed and impressed with the result! All 3 got it right based on the pure fresh taste of Cravendale! But the fun doesn't end there. We found these awesome instructions on the Cravendale website to make a cute elephant and a Rudolph and so we know what we are going to do with our empty Cravendale bottles! Disclosure: we received vouchers to buy Cravendale milk to join in with this linky and used them to buy Cravendale whole milk and semi-skimmed Cravendale milk. All opinions are our own. 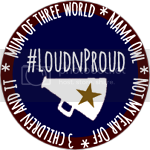 This post is an entry for BritMums #MilkDrinkersMilk Linky Challenge, sponsored by Cravendale. Find out more about the challenge here. We've been fortunate enough to have had lots of experience of staying in hotels with our children whether it was for our holidays a couple of years ago, to our road trip around the UK last year or the stays we've had earlier this year. So whilst we can't promise everything will go smoothly, we've created a short video highlighting the things we've found to be most important when staying in a hotel with kids. Choosing a hotel in a great location can make all the difference. For example, the Royal Garden Hotel is perfect for family stays in London as it has the beautiful Hyde Park and Kensington palace on it's doorstep, is close to the big child-friendly museums and has good transport links to the rest of London. This top tip is about choosing a place with a child-friendly on-site restaurant or cafe. It will make all the difference after a long days travelling to be able to get your children fed with a great meal without having to trek out to find a restaurant. It's worth checking beforehand if you need to reserve a table, then you won't miss out if it is busy and you can book it for a convenient time to you too. For any holiday, hotel break or even a meal out, we tend to do a quick online search before we book. Tripadvisor is a great place to find out how other people felt about a place. We also like to read blog reviews and ask friends for recommendations of places to stay. Its also important to find out as much as possible about what's available beforehand. If you are going to need a travel cot or high chair, just phone or email the hotel beforehand to check if there's one available or if you need to bring your own. Do the children have their own beds or a pull-out sofa? Is breakfast included? The more you know about a place before you get there, the easier things will be! Tip 4: It's not just about the kids! This tip is really about remembering that you are important too! Yes it's great to find a hotel that is child friendly and has all the facilities you need for the children, but us parents appreciate a bit of luxury sometimes and some places don't manage to meet the needs of both very well. But occasionally you will find a very special hotel that does know exactly what children and parents want. Being family friendly is not a tick-box exercise. There are plenty of places that claim to be family friendly just by having a baby changing mat or high chair available, but if your child does so much as make a squeak, you suddenly have all eyes on you wishing the ground would open up and swallow you. So we've come to recognise the difference between the places with family friendly marketing and brochures that talk the talk and those where they have the right ATTITUDE and actually walk the walk. Family friendly is not just about having the right facilities (although that of course helps), but it is to do with every member of staff you encounter on your stay, it's about the welcome you receive, it's whether they say hello to your children as well as to you. It's about knowing and understanding your needs and meeting them before you've even realised what they are. And that's what we found made Royal Garden Hotel stand out head and shoulders above the rest when it came to getting things right in terms of being family friendly. So all our tips lead us to our 1 Golden Rule when it comes to staying in hotels with children...All five of our tips ultimately fall under the same umbrella and can be summarised with this golden rule. It's not about what to take with you, what to pack, what facilities to look out for or when to travel. It is simply this.....Life can be made so much simpler by choosing the right hotel for your family in the first place! If you are looking for somewhere truly family friendly to stay where every member of staff from the point of booking, right through to arrival, to restaurant waiters and waitresses, to the concierge staff, absolutely everyone, goes above and beyond your expectations to welcome you and YOUR CHILDREN, and they have all the facilities you would expect for children and more, then look no further than the Royal Garden Hotel. This year I missed baking along with bread week on GBBO. It coincided with our Vancouver holiday so I had to catch up with watching it once we got back but I still didn't find them time to bake for that week's theme. Until now that is. I found an out of date jar of Baxters apple, fig and cider chutney. We love this stuff but I must have stocked up at some point and lost a jar at the back of the cupboard. 1. Preheat oven to 180c (fan). Line a baking tray with baking paper. 2. Combine the feta, walnuts, and chutney. 3. In a separate bowl combine the flours, bicarbonate of soda and salt. 4. Mix the contents of both bowls together and add the buttermilk to form a dough. 5. On a floured surface, knead lightly to fully combine the ingredients and shape into a round. Dust with flour and place on the baking tray. 6. Make deep cuts in the shape of a cross to look like it is being cut into quarters. 7. Bake in the oven for 30-40 minutes. I ended up baking it for around and hour as the middle struggled to cook. I think next time I would divide the dough to make two smaller loaves. We all liked the flavour so overall it turned out well. Then there was one last remaining apple on the tree. The others had ended up as crumbles, purees and I even attempted a tarte tatin. 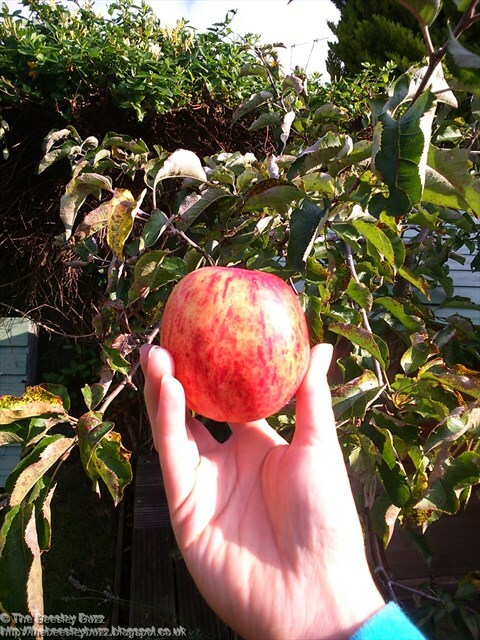 So what to do with the last apple? I had received a lovely box of goodies from Dr Oetker a few weeks ago from their #evenbetterbaking twitter competition and I knew I had to put the items to good use before 9 year old D, aka The Brilliant Chef, got his hands on them. I was particularly keen on trying out the Dr Oetker 'Surprise Inside' cupcake centres. I had a salted caramel and a rich chocolate flavour to try. So I decided to make Apple muffins with a salted caramel centre, and Chocolate Banana muffins with the rich chocolate centre. For the apple muffins, I started with this recipe from BBC Good Food for Apple Caramel Crumble muffins and then tweaked it by replacing half the flour with wholemeal and reducing the amount of sugar in it. I didn't do the caramel filling when cooking or the crumble topping either but instead used the 'Surprise inside' filling. Then it was a case of combining the dry ingredients in one bowl. The wet ingredients in another bowl. Then combining the two and adding in the apple. For the banana and chocolate muffins, I used this Nigella recipe without any tweaks. Then I filled with the rich chocolate 'surprise inside' filling once they were cooked and cooling down. 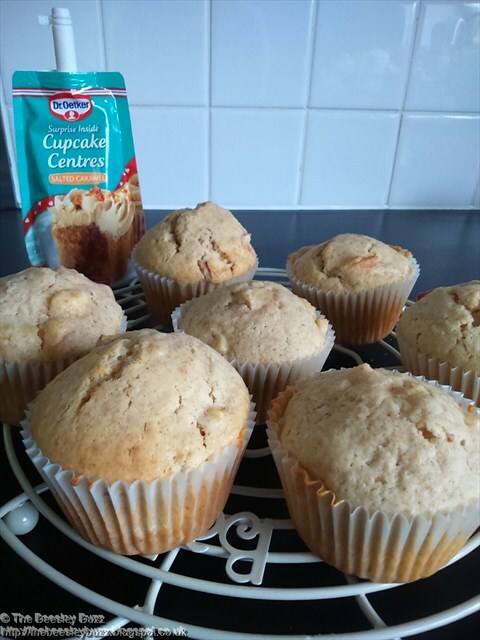 The banana muffins were topped with a piece of dried banana and the apple muffins had a Dr Oetker wafer flower on top. I'm really pleased with how both types of muffin turned out. We all especially loved the apple ones - hence the blogpost to remind me of the recipe I used so I don't forget the next time I want to make them. What an incredible 10 weeks it has been. We've loved watching the highs and lows of the bake off tent this year culminating in last nights final. I blubbed my way through the programme not really understanding why I felt SO emotional about it. I think it was the point where they showed the footage from Nadiya's home life and I think it was her husband that pointed out this was the first thing she had done for herself since she had kids. And that's when the tears started to flow. It just resonated with me so much as I'm sure it did with many mums who make sacrifice after sacrifice for the sake of their families. I wouldn't have it any other way but just occasionally it's nice to do something for myself. And baking has become that thing. Even when life is manic without a moment to spare, I know I have to make time to get in the kitchen and bake something in order to save my sanity! More often than not, my baking would end in disaster and the fear of the baking disasters used to prevent me from stepping into the kitchen too often. But this has been the year that I have finally overcome my baking fears. Whatever the outcome, I've not been afraid to have a go and bake along each week. Last week I had even decided before the show that I would attempt the bake that I considered most challenging and so I spent an entire day making white chocolate cardamom shortbread eggs and chocolate peacock feathers. This week I knew that time would not be on my side as we've had 5 hospital and doctors appointments to fit in. And yet I was determined to get my GBBO bake done. Miss T was at preschool this morning so I seized my chance before her physio appointment in the afternoon. I think all the bakes this week were challenging but again I was most inspired by Nadiya and her wedding cake. When I got married a whopping 16 years ago I had never even baked a cake, not even cupcakes, so I would never have even considered baking a wedding cake. We made do with those pre-iced cakes from M&S which we added a few ready made decorations to. So I decided I wanted to make a wedding cake this week. To give our waistlines a chance to recover after 10 weeks of baking, I opted for a miniature version of a wedding cake. And thinking of a theme was easy. After hearing the news that my favourite brand, Pink Lining won the Brand of the Year award at the #LittleLondonAwards2015, I decided to use their amazing prints as inspiration for my cake. You see, in the same way that baking has helped me gradually regain a little confidence and make a bit of time for myself, my Pink Lining bags have also been there every step of the way helping me on this journey called parenthood. You can hear more about that in our blogpost and video here. I stacked them up into tiers with a white buttercream type filling. It is a recipe I found on Love and Macarons where it is described as a Fluffy vanilla bean buttercream filling. I love this recipe because it can be made with ingredients you'd generally have at home without having to make sure you have huge amounts of cream cheese (as you would with cream cheese frosting) or chocolate and cream (as you would with ganache). I added a bit more of the 'buttercream' to the top and sides and then covered each tier with fondant icing. In my mind I envisioned a perfectly smooth cake like you see in the bridal magazines but bearing in mind I don't own any special equipment like cake smoothers, it still had a few lumps and bumps. Then taking inspiration from the Pink Lining prints I set to work creating the little flowers - tiny sunflowers, tulips and forget-me-nots. I only had a flower-punch in the shape of the ones I've used as sunflowers, but by cutting the flowers or squeezing pairs of petals together in different combinations I was able to make the forget-me-nots, the tulips and the green leaves for the tulips all using that same flower cutter. The bottom tier is inspired by the Pink Lining 'Tulips and Forget-me-nots' print (forget-me-nots are my all time favourite flower so HAD to include them). The middle layer is inspired by the Pink Lining 'Sunflower' print. And the top layer is the Pink Lining butterflies print which I love so much on my Henrietta tote bag (you can read more about how much I adore this bag here). The moment of truth arrived when it was time to cut into the cake - thankfully all those layers could still be seen. So that's it for this year. I've been so encouraged and inspired by both watching GBBO and seeing everyone's bakes on the #GBBOBloggers2015 linky. Joining in for one last time with Mummy Mishaps #GBBOBloggers2015 linky, this week hosted at The Boy who cooked. Week 1 Madeira Cake - On your Marks, Get Set, Bake Madeira cake! And it was these autumn treasures from my garden that gave me the inspiration for my Denby Cake off afternoon tea. I love the variety of a 'proper' afternoon tea - the selection of sandwiches, the variety of dainty cakes on a cake stand to choose from. But the practicalities of re-creating all those different types of cake at home on a regular basis would turn afternoon tea from a pleasure to a chore. So I wanted to create the feeling of variety without the time consuming burden of making many different types of cakes or entrements. So what I did was make a larger cake to slice along with mini ones on a tiered cake stand to enjoy. The little edible 'accessories' of strawberry ladybirds and marzipan bees add to the variety with minimal effort. As do having a couple of sandwich options available cut into fingers and hearts (without crusts of course!) Here we have cheese and cucumber fingers and ham hearts. The big autumn inspiration for my afternoon tea came from this year's bounty of courgettes and sunflowers growing in my garden. What better way than to reduce a little of the cake-guilt associated with eating cake in the afternoon than to enjoy the goodness of courgette and sunflower seeds inside your cake. This is my entry to the 2015 Great Denby Cake Off - more details here! 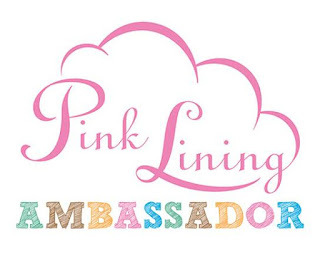 As Pink Lining Ambassadors we were extremely pleased to hear of a well deserved award for Pink Lining. 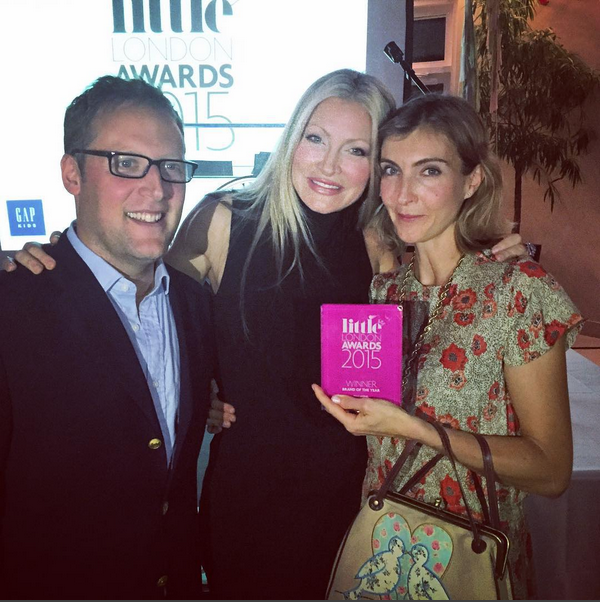 They are the winners of the ‘Brand of the Year’ category in the #LittleLondonAwards2015 announced at the awards event last night! Not only that, but they were also awarded Runner Up of the Best Changing Bag Category (In my eyes they are THE BEST changing bag as I couldn't live without my Pink Lining bags). Congratulations Pink Lining - You are awesome! So this week was chocolate week on Bake Off and before the show I made a rather silly decision. I decided that I was going to try the trickiest bake out of the 3 challenges. Chocolate tarts I've made before - albeit not ones that look as amazing or flavoursome as the ones the contestants made. Souffle I've never made and although it certainly looked technical for the technical challenge, the finished product just didn't have the wow factor for me, so I have gone for the 'showstopper' challenge - but on a smaller scale. I tried to stay true to the key elements for this week which were to use white chocolate, biscuit and make it 3D. (I did attempt 3D but my 'nest' wasn't having any of it and collapsed - but at least I tried). try not to eat too much of the leftover chocolate or you will regret it! My kitchen resembled something out of a sci-fi movie! 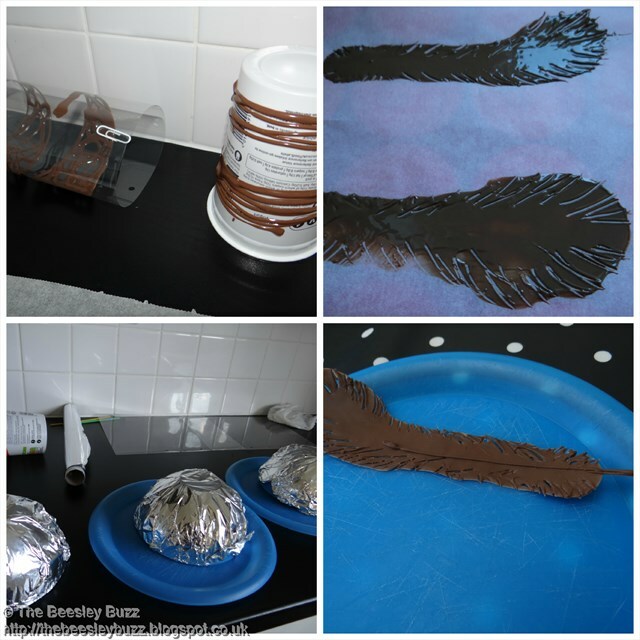 Inspired by Nadya's peacock, I wanted to attempt some chocolate feathers I had seen on How to Cook that. So I decided to make them into peacock feathers. I used a blob of white chocolate and a smaller blob of white chocolate to make the 'eye' in the peacock feathers. After the chocolate was set I coloured the larger blob green using sugar flair paste on a brush and the smaller blob blue. Then it was just a case of assembling the feather. The feathers are SO SO fragile. I made 6 and ended up with only 4 successful ones. Keep them in the fridge or freezer until you are ready or they will melt upon touch as they are so thin and chocolate melts at body temperature. If I had more patience or had planned ahead properly, I would have liked to attempt the ice sugar-water nest method that Nadya used. That can also be found on How to Cook that. But even with Miss T at pre-school today, I couldn't spare the 2-3 hours needed for the glucose water to cool in the freezer. So I used the foil-wrapped bowl technique to try to get a nest-ish shape. Because my biscuit 'eggs' were so heavy, the nest wasn't strong enough to hold them properly but I think it still had a nesty-feel to it. I'd had a go at making chocolate leaves a few weeks ago without much success but lessons learnt from that attempt meant that they turned out pretty well this time. 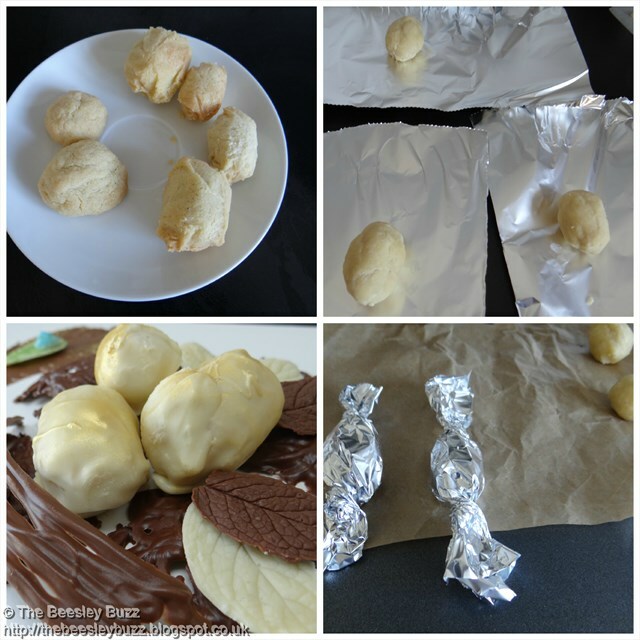 I made some milk chocolate leaves and some white chocolate leaves. I used washed mint leaves from the garden as I think it is important to use edible leaves in case any leaf residue transfers to the chocolate. The lesson I learnt from last time is to use a really thick layer of chocolate on the back of the leaf (where the leaf veins are more pronounced so will leave a better imprint on the chocolate). Forget painting on with a brush - I just used my finger to smear on the chocolate. Chill well to set the chocolate and then carefully peel off the mint leaf. I popped them back in the fridge until everything else was ready. As I mentioned the chocolate melts too easily otherwise! Coating is tempered white chocolate, brushed with gold lustre dust once set. 2. Add the ground cardamom to the flour then rub together the flour and butter to resemble breadcrumbs. 3. Add in the sugar and mix. 4. Add the orange blossom water and press into a dough. 5. Shape the dough into 'egg' shapes. 6. To maintain the egg shape whilst cooking, I wrapped each 'egg' in tinfoil like a sweetie with both ends twisted. I also made a couple of 'control' versions without the foil and they didn't fare too badly and held their shape better than I expected - so the foil step isn't essential. In fact, although the non-foil versions had flatter bases, the top was smoother and rounder rather than taking on the crinkle pattern from the foil so either method would work. 7. Bake for 20 minutes at 180C. This is longer than I would normally cook shortbread biscuits for because they are egg shaped, I wanted to make sure they are cooked through. 8. Remove from oven and leave to cool. Once cool enough to remove the foil, I placed mine in the freezer for a while. 10. Once set, I brushed with gold lustre dust and then assembled them as part of my nest/feathers/leaves chocolate creation. And that's it my day has gone and it's time for the afternoon school / preschool run. It was fun playing with chocolate although I do wonder how long this is going to last once the kids come through the front door! Our chocolate bee is ready now! Linking up with Mummy's Mishaps #GBBOBloggers2015 which is being hosted at Baking Queen74 this week.